Yaroslav Lissovolik - Programme Director of the Foundation for Development and Support of the Valdai Discussion Club, Chief Economist of the Eurasian Development Bank. Resume: The theme of trade wars appears to have firmly taken centre-stage across the globe – from impacting international trade flows to sending shivers across international financial markets. The theme of trade wars appears to have firmly taken centre-stage across the globe – from impacting international trade flows to sending shivers across international financial markets. Emerging market currencies as well as developed markets are starting to closely follow the vagaries of protectionism. And the mega-projects that were to be centered on the US – namely the Transpacific Partnership (TPP) as well as the Transatlantic Trade and Investment Partnership (TTIP) - have experienced reversals or were put on hold. But amid the gloom surrounding the globe with respect to protectionism there is a force in the works that could deliver a strong impetus to trade liberalization in the very region that currently is the main motor of economic growth in the global economy – the Pacific basin. 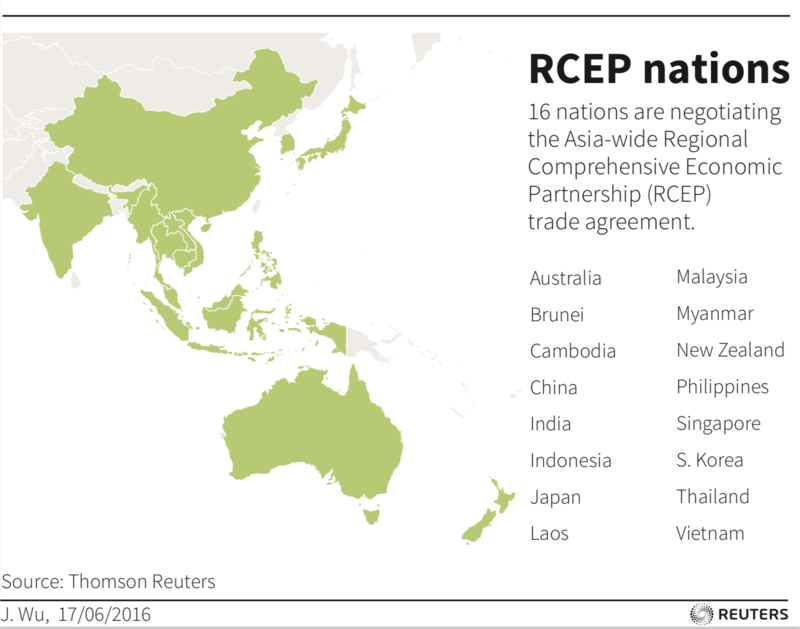 This potential force is the Regional Comprehensive Economic Partnership (RCEP) comprising China, ASEAN countries, India, Japan, Australia, New Zealand as well as Korea. At the end of August trade ministers representing the 16 potential members of the block are set to meet to discuss further steps towards solidifying the trade union in an effort to reach strike a deal by the end of this year after nearly six years of negotiations. The new mega-block is set to aggregate several large-scale FTAs, including the free trade agreements between ASEAN countries and China as well as India. If concluded the agreement would give rise to the largest mega-block and the first veritable mega-regional integration arrangement, which accounts for nearly 3.4 billion people and close to 40% of the world’s GDP on a PPP basis. The clinching of the RCEP deal would represent not only an important contribution to trade openness in the region, but would also further underscore China’s leading role in the global economy in advancing liberalization and economic openness. It would likely also take some of the lustre from TPP, with China significantly shifting the initiative in its own favour in the Pacific region at the expense of the US. The race in the global economy directed at building the largest mega-blocks is on and it seems like China is getting ahead. 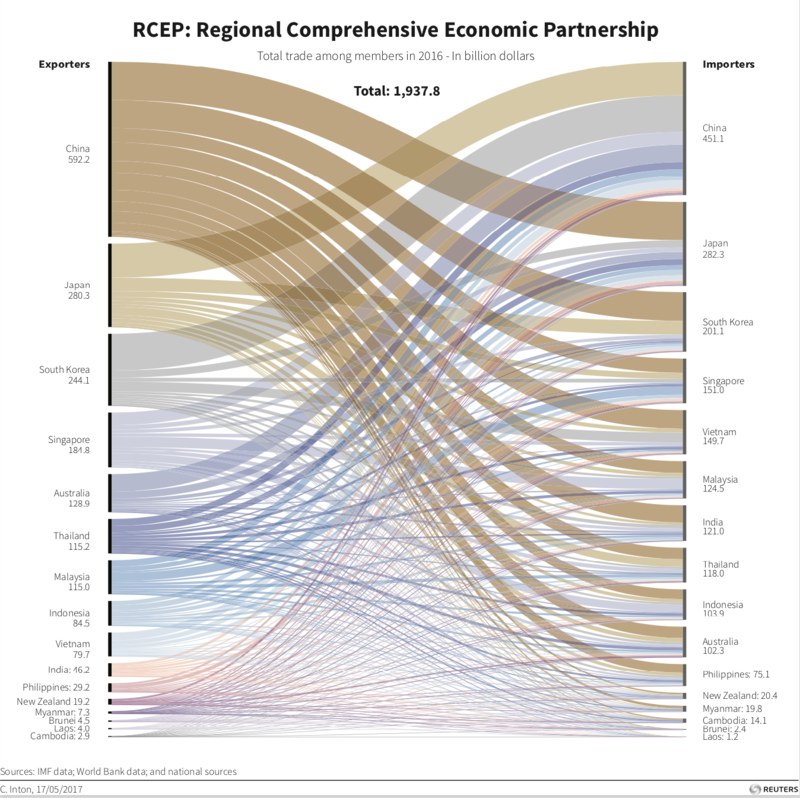 Against the backdrop of the advancement of the RCEP project, the BRICS-plus paradigm predicated on the aggregation of the largest integration arrangements where BRICS countries play a key role (the acronym for this group of integration arrangements being BEAMS) – see BEAMS of the sunrise: a look at BRICS 5-year cycles, Valdai discussion club, June 2018– may be seen as a further potential contribution to opening global markets, though more focused on the South-South dimension. In a way the BEAMS/BRICS-plus grouping may be also viewed as a reserve option for China and India to pursuing a more diversified global approach to building mega-blocks compared to a more regional focus of RCEP. Indeed, the RCEP project may result in a further shift of economic activity and trade into the Pacific, which would further raise the concentration of global growth and the dependency of the global economy on the performance of the Pacific basin. In this respect by virtue of its wide geographical coverage the BEAMS/BRICS-plus network is more diverse and is more conducive to rendering economic integration more balanced and spread across the main regions of the developing world. Being more inclusive and open-ended compared to regionals/mega-regionals it is a project that is less likely to result in trade diversion and spillover effects for third parties. Importantly, however, there may be significant positive spillovers from the RCEP project to the formation of a wider BRICS-plus/BEAMS framework. First and foremost this is about bringing ASEAN countries into closer partnership with the largest economies of BRICS, namely China and India. It is also about forming a firmer China-India-ASEAN FTA triangle within the BEAMS framework, in which other such triangles could include South Africa-Brazil-India (IBSA, with Mercosur already clinching a preferential deal with SACU) as well as the “Eurasian Economic Union-SACU-Mercosur” triangle, in which trade policy of the respective BRICS countries is largely delegated to the regional RTA level. A combination of BRICS-plus and RCEP provides China, India and ASEAN countries with the option of building South-South cooperation platforms, while at the same time introducing mega-blocs that include dynamic representatives of the developed world. BRICS-plus may also serve to limit any trade diversion effects from the formation of regional mega-blocs for the BRICS economies and their regional partners that have not participated in the formation of RCEP. In building ever-larger mega-blocks it will be increasingly important to envisage and plan ahead mechanisms of cooperation with other regional and mega-regional blocks. After all, with the coming of the era of mega-blocks, spillover effects from large-scale economic integration are likely to become increasingly significant.